Hello. My name is Hibiki Itagaki, and I’m working in Evergreen Outdoor Center as an intern. Today, I worked with Jaja to prepare for the canyoning tours. 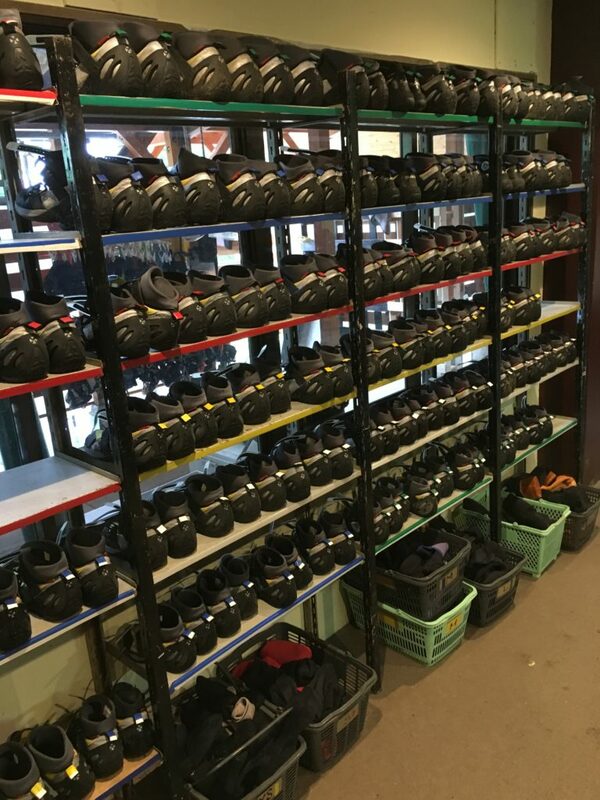 The purpose of the preparation was to move the wetsuits and canyoning shoes from the storage to the tour office, to sort them out by sizes, and find and replace any damaged equipment. We sorted out the wetsuits so that we can pass out the wetsuits to customers smoothly and canyoning shoes were also sorted out by sizes as well. After we finished sorting out all the canyoning gear, I realized Evergreen has tons of gear! We have canyoning shoes from 23cm to 31cm (EU:37-47 US:5-13). If your shoe size is smaller than 23cm, don’t worry. Participants of the canyoning tours also wear canyoning socks which are thicker than regular socks and are made of wetsuit material. If the canyoning shoes are still big, you can put two pairs of socks on your feet so that you can get the perfect fit and extra warm. Today, Jaja told me that the outsole of the canyoning shoes is made of the special grippy rubber. This outsole creates a lot of grip, so you can walk on wet rocks with these shoes. I touched the outsole, and I could tell difference between regular shoes and canyoning shoes because the outsole was so sticky. I took a rock climbing class in the college, and I have worn climbing shoes before. 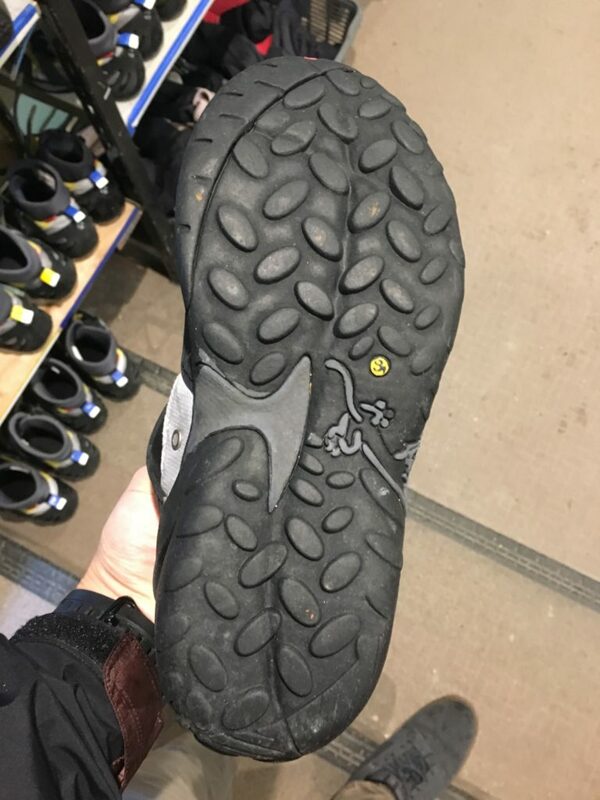 Climbing shoes also have grippy outsoles. However, I felt canyoning shoes’ outsole is softer than climbing shoes’ outsole. I think this is because soft rubber is used for canyoning shoes to create grip on wet rocks. However, as canyoning shoes are specially designed to keep feet warm and to create grip on wet rocks, they are expensive. Don’t worry!! The price of the Evergreen canyoning tours includes a rental wetsuit, a rental helmet, rental canyoning shoes, rental canyoning gloves, and a rental harness. Evergreen provides everyone with the best gear for the tours!! The canyoning tours are offered from June 3rd. If you are interested in those tours, please check the link below.